The mythical city of Atlantis may now have some very real map coordinates. An international research team led by Professor Richard Freund at the University of Hartford, CT believes it has located the lost island, which historians think was buried underwater by flooding thousands of years ago. "This is the power of tsunamis," Freund told Reuters. "It is just so hard to understand that it can wipe out 60 miles inland, and that’s pretty much what we're talking about." 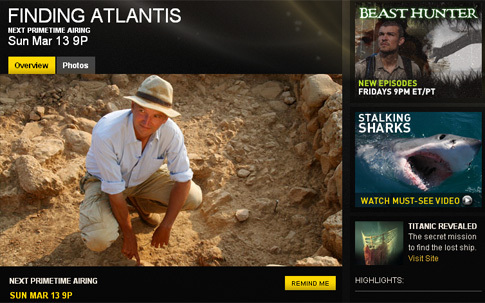 The team's discovery, revealed on the National Geographic Special "Finding Atlantis" Sunday night, has been in the works since 2009, when the researchers began investigating a satellite image that seemed to show a city buried beneath a marshland in southern Spain. Using radar technology, digital mapping and satellite imagery, Freund's team believes it located where the ancient city once stood in the swampy region of Dona Ana Park by finding a regular pattern under the surface not normally found in nature. That apparently man-made pattern led Freund to hypothesize he had found the spot where Atlantis was buried in mud after being submerged by a natural disaster. The proof, he says, was the discovery of over 100 "memorial sites" near the area, which he believes were created by residents in honor to their destroyed city. "We found something that no one else has ever seen before, which gives it a layer of credibility, especially for archeology, that makes a lot more sense," Freund told Canton Patch.com. Greek philosopher Plato, the source of the Atlantis legend, described it as an island "larger than Libya and Asia put together" in 360 B.C. He said the wealthy, sophisticated city, located in front of the Pillars of Hercules - what is now known as the Straits of Gibraltar - had been decimated by earthquakes and flooding 9,000 years before. Based on Plato's clues, historians have speculated about the location of Atlantis for centuries, though no one has confirmed the island's existence.